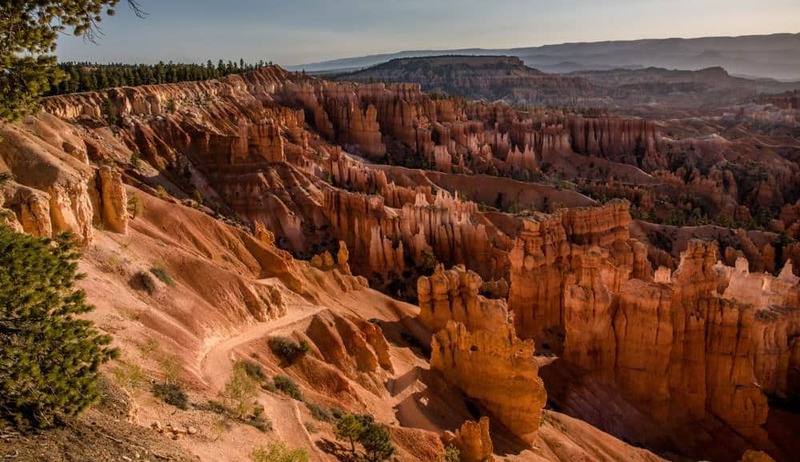 Bryce Canyon National Park in Utah, USA isn’t a canyon, but a series of carved out natural amphitheaters. 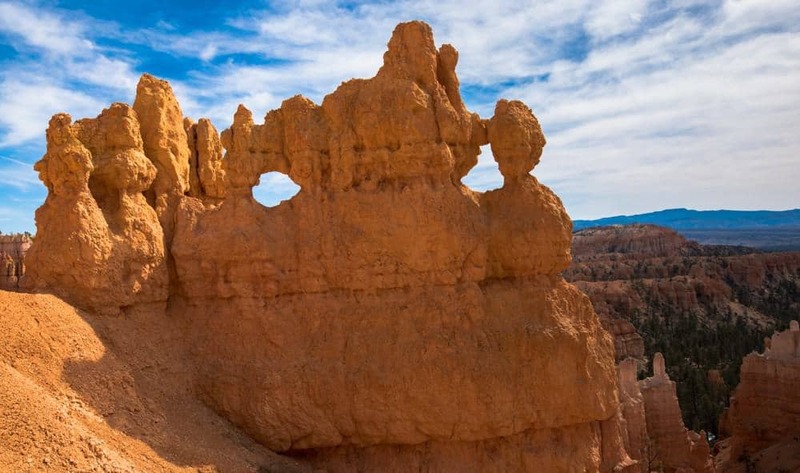 It’s known for the colorful formations of hoodoos, fins and natural bridges. 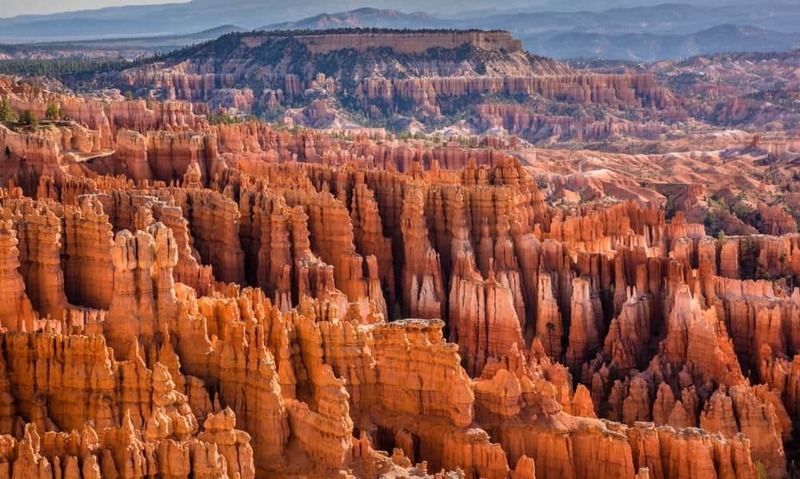 People come from around the world to see the amazing Bryce Canyon views of these formations. What creates these unique rock structures? The erosion process begins with rain water seeping into cracks in the rock. 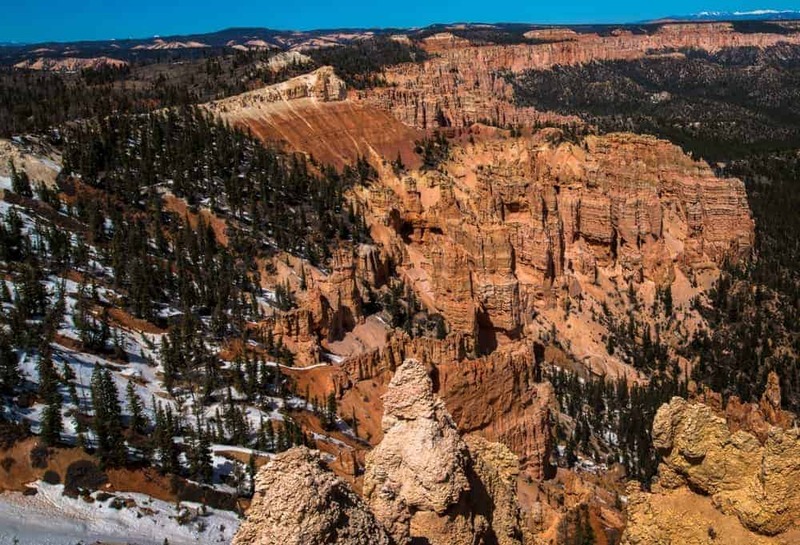 Due to its high elevation, the nights are cold at Bryce Canyon. The water freezes, expands and breaks the rock apart. The deep, narrow walls called ‘fins’ result from rain and snow melt running down the slopes from the rim of the canyon. Holes or ‘windows’ continue to erode into the fins, and when they grow large enough they collapse and create the hoodoo towers. 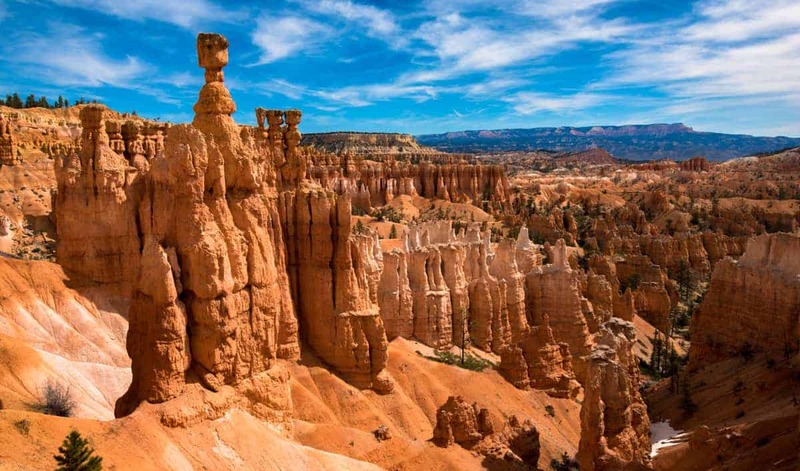 The section of Bryce Canyon known as The Amphitheater has the most concentrated grouping of hoodoos. 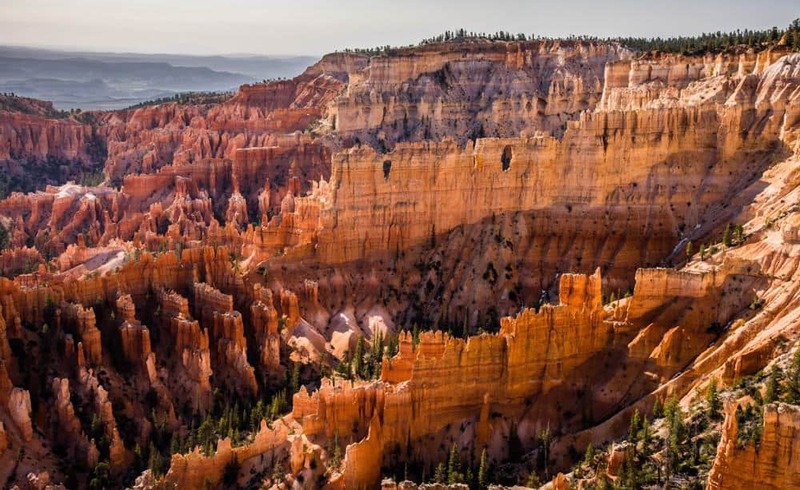 We feel there are 8 Bryce Canyon views that provide the best photo spots in the park. 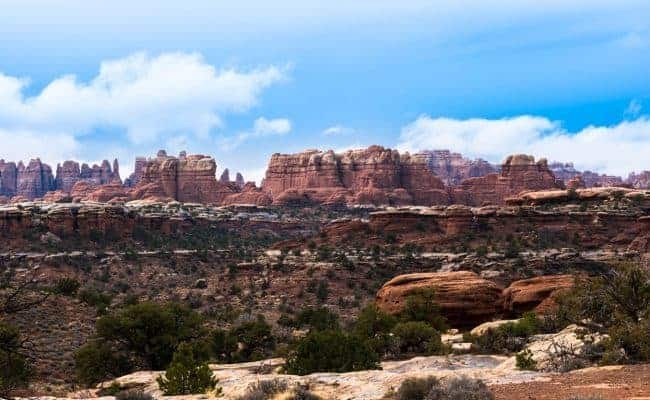 The viewpoints can be found at overlooks along the Scenic Drive, at spots along the rim trail in The Amphitheater and along the hiking the trails where you get a close-up view of the stone structures. 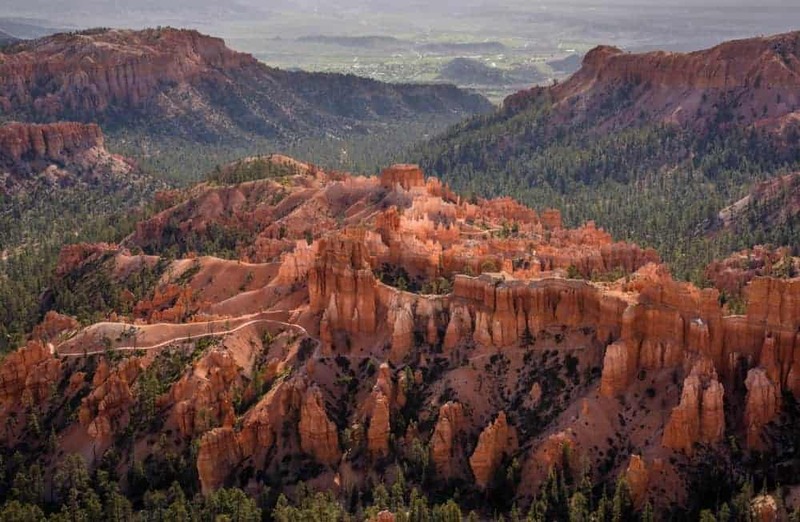 When visiting Bryce Canyon, we recommend you begin by driving 18 miles to Rainbow Point at the end of the Scenic Drive. All the scenic overlooks are on the east side. If you start at Rainbow Point, you can avoid left turns on the busy road. You can instead stop at each pullout on your right. Rainbow Point is a good introduction to Bryce Canyon. The scenery and geological formations dramatically change as you drive north. Completing the scenic drive at the Amphitheater viewpoints is a spectacular sight! The park road ends when it reaches the combined parking area for Rainbow Point and Yovimpa Point. 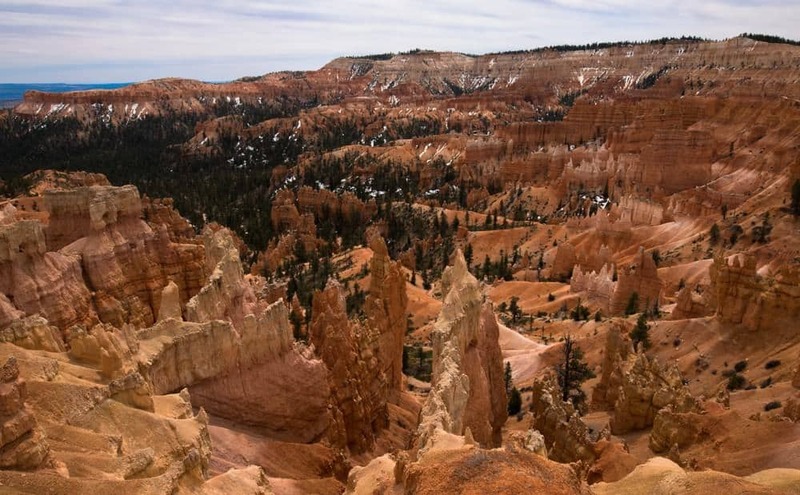 From this vista you look down on a colorful scene of hoodoos in Rainbow Canyon. You see the Table Cliff Plateau to the northeast that rises to over 10,000 feet at its southern end, Powell Point. The Sevier Plateau to the north is topped by 11,041 foot Mount Dutton. The short Bristlecone Loop Trail leads to an 1,800-year-old bristlecone pine, believed to be one of the oldest living things at Bryce Canyon. PHOTO TIP: The light in the southern end of the park around Rainbow Point is wonderful from mid afternoon through sunset. Yovimpa Point: We missed this point on our trip since we didn’t realize you accessed the trail from the Rainbow Point parking lot. Learn from our mistake. A short, paved walkway takes you past the picnic area to a magnificent viewpoint that allows visitors to look south and west over the Grand Staircase-Escalante National Monument. It is one of the best spots to see the “steps” which give the Grand Staircase its name. Agua Canyon overlook has some of the best color contrasts you’ll find in the park and two prominent hoodoos. The Hunter, with a hat of evergreens, rising mightily just in front of the viewpoint is one of the most impressive hoodoos in the park. To the right is a smaller hoodoo commonly referred to as The Rabbit (the The Hunter’s prey). 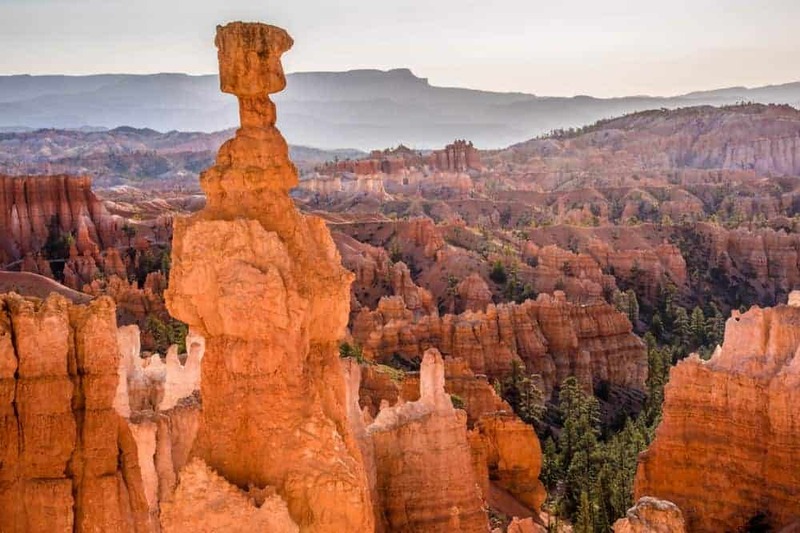 PHOTO TIP: The hoodoos and fins to the right of the overlook; which can be especially dramatic in early morning light. The structure called Natural Bridge is technically an arch. Formed originally as a small ice window in a large prominent fin, the forces of erosion have made Natural Bridge one of the most popular stops on the scenic drive. You will see similar features within the park as you explore, but none as impressive at nearly 125 feet tall. PHOTO TIP: Natural Bridge is best photographed mid-morning when the sun is high enough in the sky that it nicely illuminates the features around the arch and bounces ample light onto the underside. From many vantage points, being careful to stay behind the railing, you can frame rich green Ponderosa pine trees through the arch. The viewpoint is named for Ebenezer Bryce, who settled the area in 1870. Due to its elevation at 8,300 feet, Bryce Point offers one of the most scenic vistas of the hoodoo-filled red rock amphitheater. It is famous for the extraordinary sunrises where the tops of the hoodoos glow with a brilliant burst of light. It is also beautiful throughout the day. With views looking mostly to the north and east, you can see Boat Mesa and the rich colors of the Claron Formation. The view from Inspiration Point is spectacular. This is our favorite Bryce Canyon view and photo spot. The light creates glowing reds, oranges, pinks and more around the fins, spires, hoodoos and ever-eroding canyon walls. This is the best location for panoramic photography. But we also like to zoom in on smaller sections of hoodoos at this viewpoint. Don’t limit yourself to the designated overlook. Be sure to walk along the Rim Trail to find that perfect composition. WARNING! The cliffs of Inspiration Point are exceptionally dangerous as they are formed of crumbly rock, slippery slopes and sheer drop-offs. All visitors are strongly cautioned to remain on trails and behind railings. 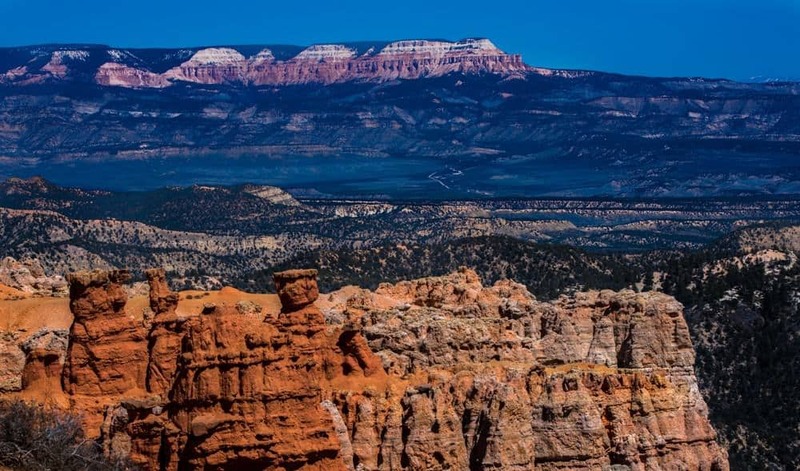 Sunset Point offers dramatic views of some of the most famous and breathtaking of Bryce Canyon’s hoodoos. 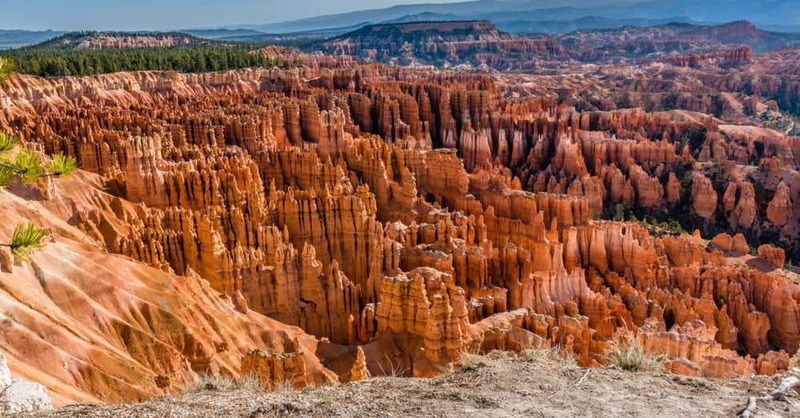 The Silent City is a maze of hoodoos and fins packed in close proximity directly below the point and to the south. Despite the name, this location is not the best for sunset photography unless you’re lucky enough to have great clouds to bounce light into the canyon. Every photographer’s guide will include Thor’s Hammer, one of the most well-known formations in the park. 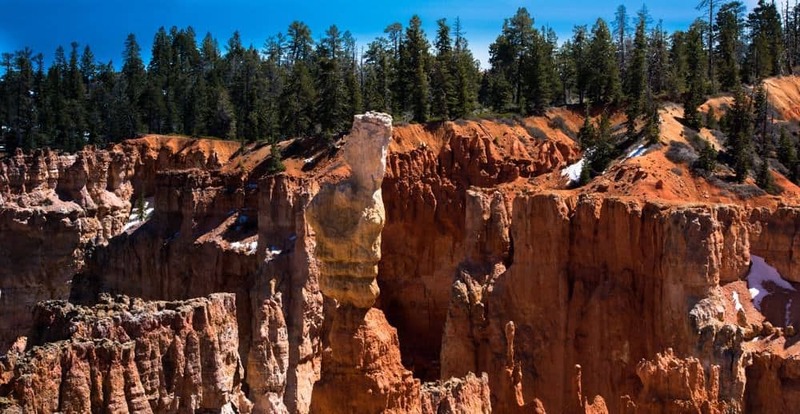 You can see why this famous hoodoo is a Bryce Canyon must-see view and photo spot. It can be found just below the Sunset Point overlook on the northern edge. 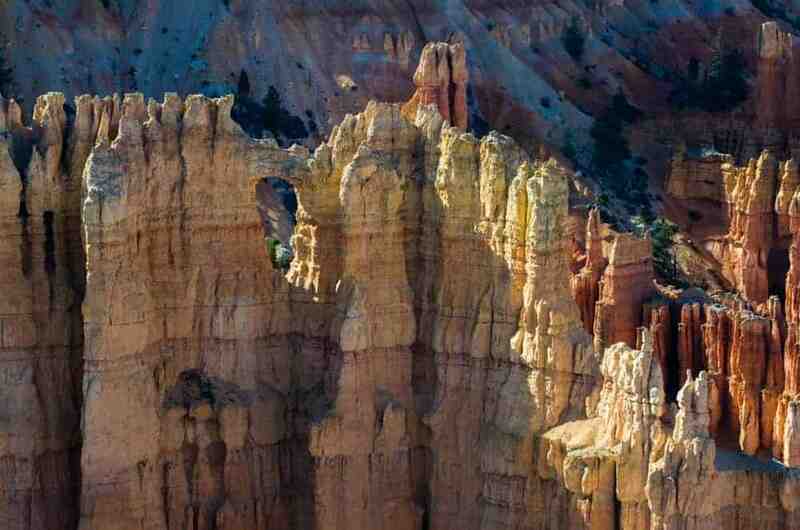 It’s one of the iconic Bryce Canyon pictures because it’s isolated from the other hoodoos and has a striking form. PHOTO TIP: The ONLY LOCATION to photograph Thor’s Hammer is walking down the Navajo Loop Trail, one of the best Bryce Canyon hikes. 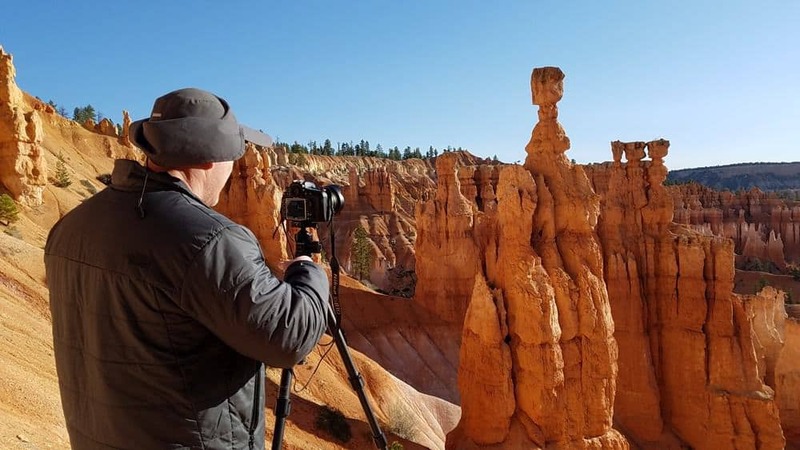 The Bryce Canyon views overlooking the Amphitheater along the Rim Trail are spectacular, but to see and photograph the hoodoos and windows up close is something YOU MUST DO! You don’t need to walk the entire trail. 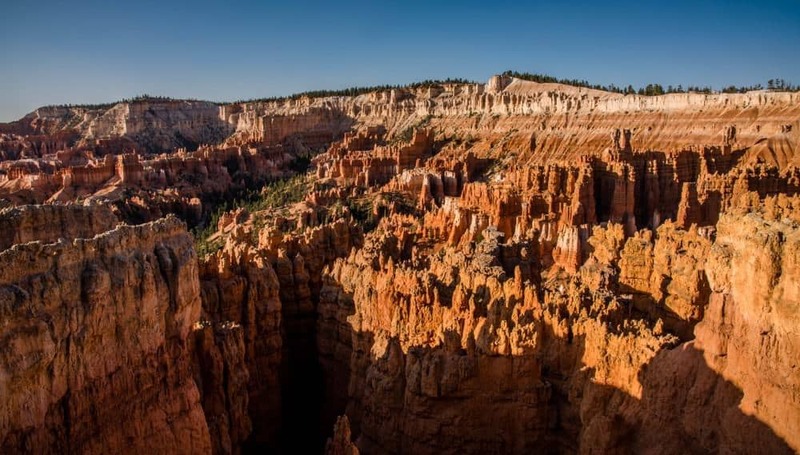 The best Bryce Canyon view and photo spot to see Thor’s Hammer and windows is just below Sunset Point down the Navajo Loop Trail just a bit. Trust us! PLEASE stay on the trails. The increasing love for nature impacts outdoor areas which suffer from litter, trail erosion and more. Do your part to be a responsible visitor. Sunrise Point offers incredibly colorful vistas at sunrise as the sun casts an early morning glow on the red rock hoodoos. The early morning light makes it the ideal location for photography. It is also one of the better spots for sunset photography. The view to the northeast captures Boat Mesa and the Sinking Ship, incredible rock formations set against the stark Pink Cliffs of the Aquarius Plateau. Walk along the Rim Trail near the viewpoint to get different views of the amphitheater and hoodoos. 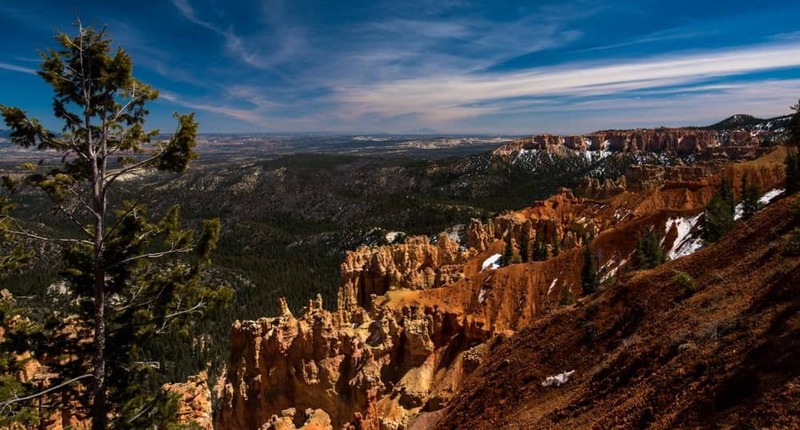 Want to see more amazing photos of Bryce Canyon? 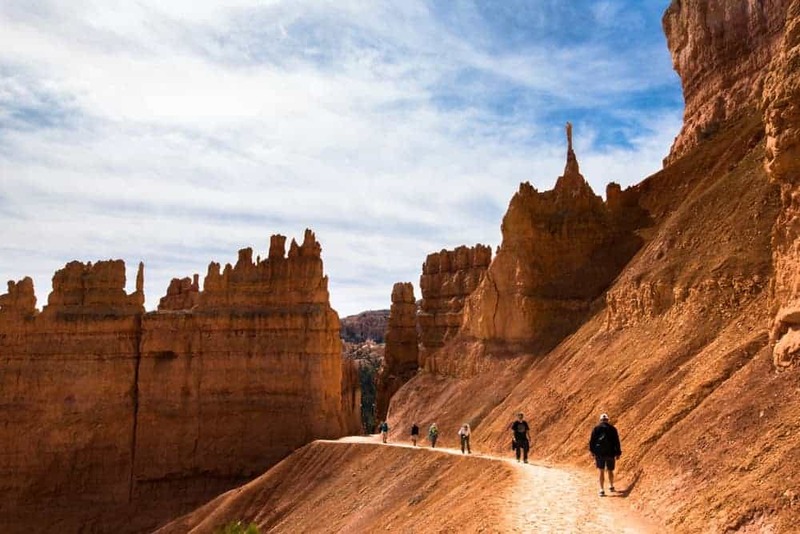 Check out ‘How to Spend 24 Hours in Bryce Canyon‘ from our friends at We12Travel. For the best sunrise shots, you want to arrive at your designated location along the Amphitheater Rim well before the sun rises. Most of the time this means total darkness. Use a flashlight or headlamp to light your way from the parking lot to your spot. Wearing a headlamp allows you to set up your equipment without having to hold a flashlight. Remember to keep the beam pointed on the ground in front of you to avoid disrupting other photographers in the area taking long exposure shots. 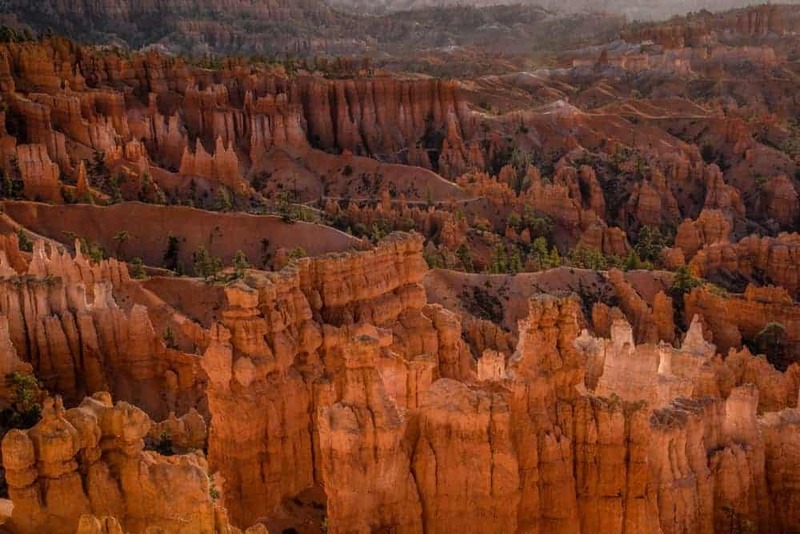 Due to the elevation, Bryce Canyon gets cold at night even during the summer. The cold can drain camera batteries fast. Cover the camera when you are not using it or keep a spare set of batteries close to your body. Hand warmers and layers are important to help keep you warm too. The Bryce Amphitheater is a very dramatic place to watch the sunrise. There is a deep silence before dawn. Anywhere along the rim between Sunrise Point and Bryce Point is a wonderful view. Most of these overlooks and canyons face east. You will be shooting into the sun at sunrise, but the formations in the canyon help produce a soft, warm glow of reflected light at this time. 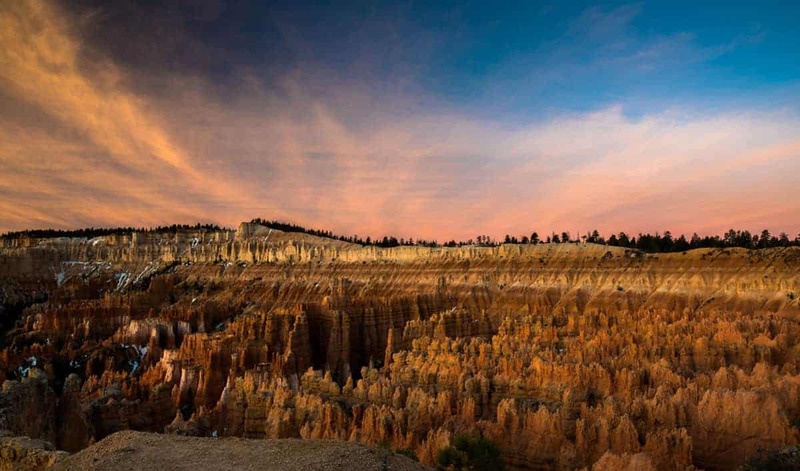 Capture the glowing hoodoos in the first hour after sunrise. The low light conditions require a very steady hand to get a blur-free photo. During this time use a tripod and remote shutter release. As the sun rises higher in the sky, the broader vistas become washed out. The reflected light continues through late-morning making it perfect to focus on the hoodoos, fins, windows and trees in the canyon. Be creative with composition by taking pictures through rock holes, tunnels, windows and between cliffs. Unusually shaped frames can add drama to the shot. Long shadows are cast into the canyon beginning late afternoon as the sun sets and light is only apparent on the tops of the hoodoos. Concentrate on any side-lighting of the hoodoos that aren’t in shadow. If there are clouds in the sky, they may bounce light into the canyon to help reduce the shadows. Otherwise, the big vistas provide wonderful telephoto shots from any viewpoint in the amphitheater during sunset. The ‘golden hour’ after sunset may produce a pastel pink and blue sky above the canyon. Take advantage of the late dusk glow. The hoodoos reflect light not seen by the human eye, but easily picked up by the camera’s sensor. Exposure times will need to be longer, but the images will capture the warm colors of the formations and the blue sky. 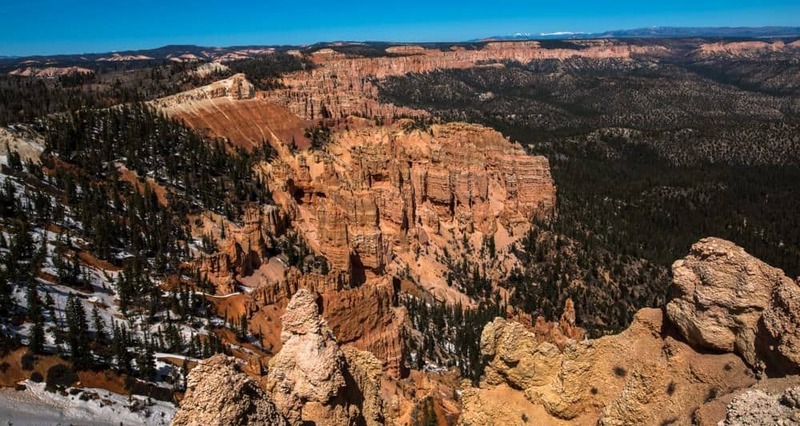 We often get asked when it’s the best time to visit Bryce Canyon. For us, we prefer spring and fall to enjoy a bit cooler weather and avoid the crowds. Due to the higher elevation of Bryce Canyon, spring weather can be unpredictable. It can be rainy and may even snow. We enjoy the cooler weather during the spring for hiking. Fall is nice with the leaves changing colors and it starts getting cooler again. Summer is the most crowded and gets hot during the day. If you do go in the summer, plan to enter the park and hike early in the day to avoid the crowds and heat. We have yet to venture to Bryce in the winter, but would like to try some day. Again, due to the elevation, there could be snow storms, but on a clear day it’s just beautiful with the white snow against the red rocks. 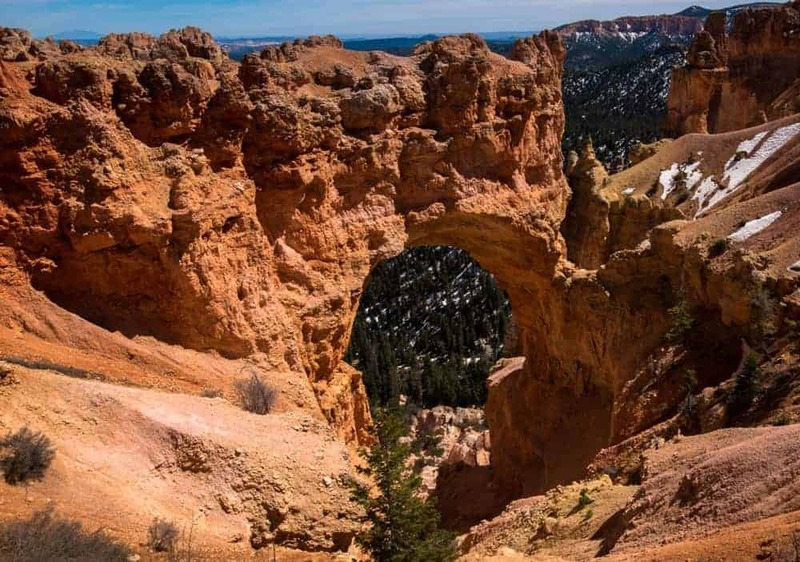 Here are the best options for accommodations close to Bryce Canyon. Campgrounds – North and Sunset are the two drive-in campgrounds within the park surrounded by the area’s beautiful, iconic ponderosa pines. Both campgrounds are available to RV and tent travelers and have flush toilets and drinking water. 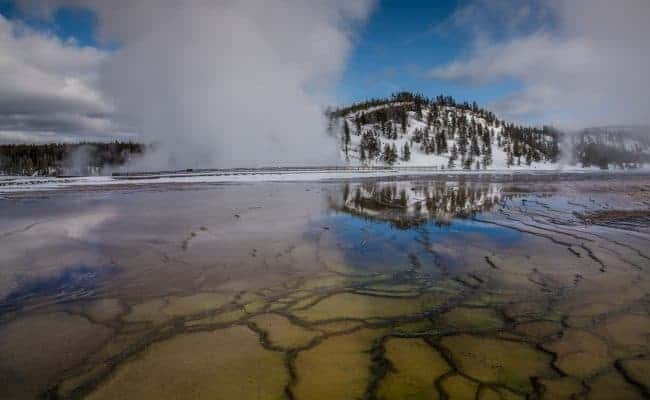 Some sites are reservable, but most are first-come, first-served. Discounts are available for National Park Pass holders. Indoor lodging – The Bryce Canyon Lodge, located a short walk from several trails and lookouts, is a national historic landmark and the last remaining of the original park buildings constructed in the 1920s. It’s a no-smoking facility and, to maintain its authentic rustic feel, there are no televisions. The lodge’s unique design and use of local materials will take you back to a time when all the national parks of the West featured “destination hotels” to attract visitors. Outside the park – Bryce Canyon City is adjacent to the park and has many hotel options that include restaurants and shopping. There are many options for lodging to suit your needs in any of the small towns along Highway 12 (Tropic, Cannonville, Henrieville, Escalante and Boulder). We stayed in a cozy cabin in Cannonville on our latest trip. It had a mini fridge and microwave so we could prepare many meals there and avoid the cost of eating out every day. We chose a mid-way point between Bryce Canyon and Escalante/Boulder since we would explore all these areas during our time there. If you choose to stay outside of Bryce City, please understand the limitations of food establishments along Highway 12. There are some restaurants in the various small towns, but you can’t plan around their advertised or posted hours. The eateries open and close at any time with no apparent reason. We arrived at one restaurant for lunch during the posted hours for that meal. As we walked up to the front door the woman inside turned the Open sign to Closed right in front of us then walked away. During the slow season of October through May, many restaurants close. There is a small grocery store in Tropic and a few gas station mini marts along Highway 12. To be safe, we recommend you have back-up food to eat in your car as you explore Highway 12 just in case there are no restaurants open along the way. Visit our friends at VeraWise WOW Travel for even more Outdoor Adventure Destinations. This is such a good post and the video was really nice! I’m sorry I am just now getting to it, but I really enjoyed and it and I am tucking it away for my trip in a few months!! Great job!! So excited for you to see Bryce Canyon. I can’t wait to hear all about it! These pictures are beautiful! We have this national park on our list to visit and almost made plans to swing by this summer, but are traveling to Sedona instead. Maybe next year….. Utah has some of the most stunning landscape. I agree that Utah has stunning landscape 🙂 There are so many places to put on our bucket lists huh!? Those images are gorgeous! I’ve been there only once while on a road trip from NY to AZ. We camped along the way, and made a stop at Bryce Canyon but didn’t arrive until well after dark. We didn’t actually know much about Bryce or what to expect. When we got up the next morning and saw that view, we were amazed! We’re to bring our kids there soon – all of your info will be so helpful in planning that trip! What a cool experience to wake up to those hoodoos not knowing what to expect beforehand! That’s quite a road trip from NY to AZ, wow! You really captured the essence of this park in this set, although nothing like visiting the place physically. I like the formation of the rocks and the rainbow point. I wouldn’t even believe the area is interesting if I were just shown one picture of the place. Thank you. I traveled there back in the 70’s and 80’s. Truly enjoyed the sights, still have my slides from the area. I hope to get back there someday! I wonder what has changed since your visits back then to now. It would be fun to see your slides to compare. I hope you can visit again some day Steve. I have copies of my slides if you are interested in seeing what they look like. Only I did not even give a thought to composing back then just taking pics! Dave and I would be very interested in seeing some of the copies of your slides. Email me at [email protected]! 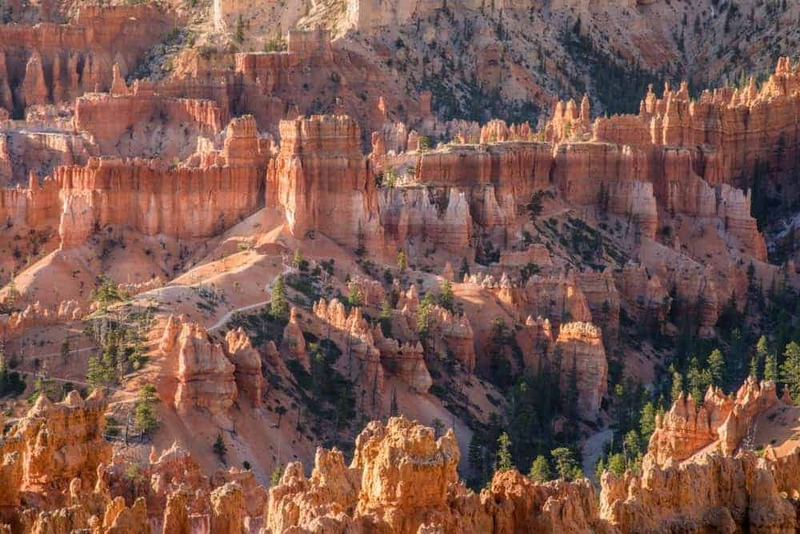 Bryce Canyon looks so amazing! I’ve wanted to visit there for so long, but whenever we travel to the US, we’re never in the area! I hope one day we get to tick it off my list of NP’s to visit! I hope you get to visit one day – the rock formations and colors are breathtaking! This place looks perfect for photography. It reminds me Cappadocia though. Thanks for the info!!! I just looked up Cappadocia – very similar! And yes, a paradise for photography! Wow I wish I had this before I went to Bryce! I was there for only one day in November a couple years ago. I had a beautiful day and enjoyed it so much. Inspiration point is incredible. Your photography is gorgeous and brought back so many great memories. Inspiration Point is the one we didn’t do – silly us! We plan to go back soon to make sure we see that overlook and to hike the Fairyland Trail. I hope you get to visit one day – your kids will love the park! Wow! So many canyons just in one area – all are gorgeous! This is a really detailed post and helpful for when we visit the US sometime soon! Great tips! Yes, so many overlooks/canyons and each one just a bit different. I hope the article helps people plan their visit. Woah what a great comprehensive post! I’ve always wanted to take a road trip to the US and do something like this. Your pics are awesome and the amount of tips and detail you’ve included is just fab – priveless! Thank you. We really want to help people make the most of their visit so I’m glad the photos and tips we included are helpful. This is so beautiful! I love national parks so much. National Parks offer so much beauty and time to be in nature – we love them too! Bryce Canyon is stunning. I’ve been there a while ago and it’s still one of my favourite canyons. Thank you for this detailed article, it is really useful and would have helped us plan our trip better. We spent 3 days there and felt it wasn’t enough…so much to see! ahh I’ve always wanted to visit Bryce Canyon! Your pictures are gorgeous 🙂 and I love the the chocolate waterfall! so fun! The muddy waterfall was definitely unique. Spectacular National Park to visit, hope you can make it there one day. Great guide and I love the photography tips! Bryce Canyon looks really beautiful. 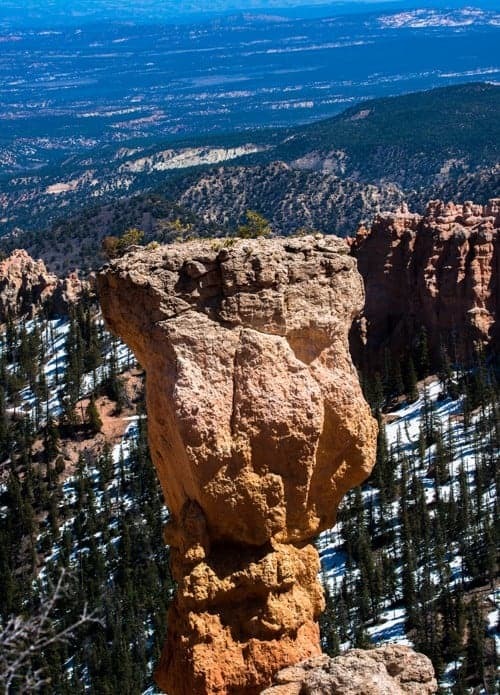 I’d love to do the Navajo Trail and see Thor’s Hammer. The Navajo Trail was the highlight of the trip for me – amazing to walk up close to all the hoodoos.